He's holding up a review copy of THE HOLY TERROR, I have one I found *sigh* in a used book store in NYC, The Strand. 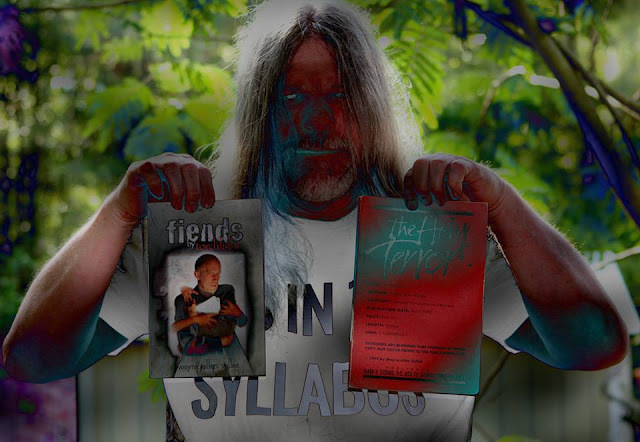 Roger Dale Trexler published the collection FIENDS BY TORCHLIGHT. I know Charles through Sidney G. Williams, another in our group of incredible writers hardly anyone has heard of, who has a dozen of his own novels in print. Charles mixes up science-fiction with horror, and to me, his finest book is COLD IN THE LIGHT. This photo notwithstanding, in every other photo of Charles, he looks like Kurt Russell in the remake of THE THING.